When I read those words a couple of weeks ago in the New York Times Book Review, I was struck by a variety of sensations: amusement, a bit of shock at Keillor's honesty and modesty, and last but not least, a sense of recognition. As a teenager, I had my writing future all mapped out for myself. A four-year degree with a minor in education (had to have a day job, right?) followed by an MFA program somewhere after which I'd win grants and hone my craft at places like Breadloaf. Before the age of thirty, I predicted, I'd have a book reviewed in, yes, The New York Times. I even had the pull quote which would appear in the review, one which danced around my naive little head for years: "A luminous work of love, loss, and redemption," a blurb which would be emblazoned across the back of a shiny trade paperback. Yup, love, loss and redemption, that was going to be me. And it was, but not at all in the way I thought. The love ended up a in a passion for my day job, teaching. What was supposed to be a stepping stone in my brilliant writing journey, instead ended up a beloved (and if I do say so myself) and successful career. Also a long one. And that's where the loss comes in. Teachers don't have a whole lot of free time, at least during the school year. And teachers who come home to three boys aged 15, 10, and 8 have even less. So while there were a few fits and starts on my magnum opus during the summers, none of them amounted to much. That first book was, in fact, a romantic comedy based on Much Ado about Nothing. It was told in the first person. It was funny, one might even say entertaining. And it was--and I say this proudly--unabashedly chick lit. Once I finished that book, I realized that I could do one of two things: I could spend my life straining for brilliant. Or I could perfect clever. And it was really a no-brainer. Clever got me an agent. Clever got me my first contract. Because I was--and am--much better at entertaining people than I am at making them think. My mysteries are considered cozies, a genre beloved by many thousands of people, most of them women and most of them loyal to series they love. And I know that Certain Factions (slipping into Miss Rosie here) malign those readers and this genre, much as they malign romance writing and romance readers. Every now and then, one of them even asks me the question that forms the title of this post: When are you going to write a real book? You know the kind--they are serious. They are literary. They win prizes that are not sponsored by the Romance Writers of America or named after Agatha Christie. And they get lots of ink in the Times. And now I'd like to share a story. Not long ago, a reader contacted me through Facebook to tell me that her mother loved my first mystery, Murder and Marinara. But because her mom has Alzheimer's, she keeps asking her daughter to read the book with her over and over again. Each time she denies she's read it before. "And you know what?" her daughter told me, "She loves it every time." Honestly, who needs The New York Times? Not me. Not anymore. A Jersey girl born and bred, bestselling author Rosie Genova left her heart at the shore, which serves as the setting for much of her work. Her new series, the Italian Kitchen Mysteries, is informed by her deep appreciation for good food, her pride in her heritage, and her love of classic mysteries, from Nancy Drew to Miss Marple. 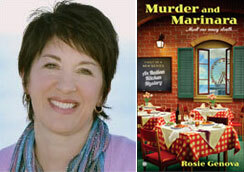 Her debut novel, Murder and Marinara, was named a Best Cozy by Suspense Magazine and is a finalist for a Daphne Award. An English teacher by day and novelist by night, Rosie also writes women’s fiction as Rosemary DiBattista. She lives fifty miles from the nearest ocean in central New Jersey, with her husband and the youngest of her three sons.